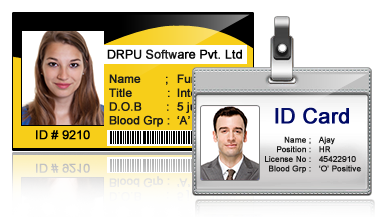 DRPU ID Cards Maker (Corporate Edition) creates different types of ID cards including Student ID cards, Visitors ID cards, Gate Pass for the visitors etc. You can design list of id cards with different barcode value and text using 'Batch Processing Series' option. You can easily design your ID card by browsing the details using Excel file also. For quick designing of ID cards, you can use Pre-defined templates, fill user details and your ID Card is ready to print. Software is having "Live Group and Batch Processing" mode for designing id cards of group of people simultaneously using Excel data. 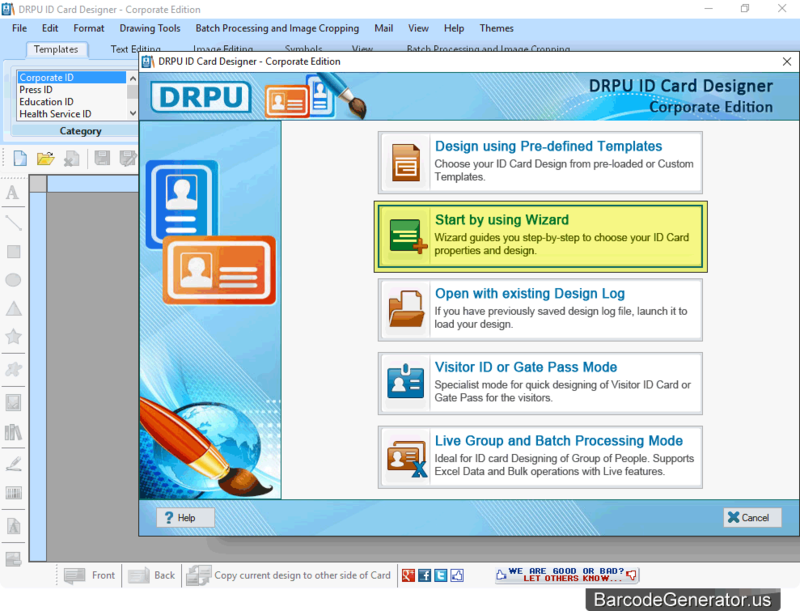 Choose any mode for designing ID Card as we have selected 'Start by using Wizard' mode for demonstration purpose. ✔ Print Designed ID Cards: Option to print your designed ID cards using advance print settings. ✔ Batch Processing Series: Using this feature, you can design multiple ID cards along with different barcode value and text. ✔ Image Cropping Tool: To crop a single image or multiple images for your ID Card. ✔ Browse Data From Excel File: Software provides ideal mode "Live Group and Batch Processing Mode" for ID card Designing of group of people using Excel Data File. ✔ Export designed ID Card: You can export your designed ID card As Image, As Template and As PDF file format. ✔ E-mail Setting: Software provides E-mail setting feature to send created ID cards at specified email address. ✔ Camera Setting: You can take pictures using Camera, while designing ID Card. ✔ Copy Card Design: Software is having an option to copy current design of ID card to the other side of card. ✔ Design using Pre-defined Templates: You can design ID card by choosing pre-defined templates as per your requirements.